What a great idea this is. 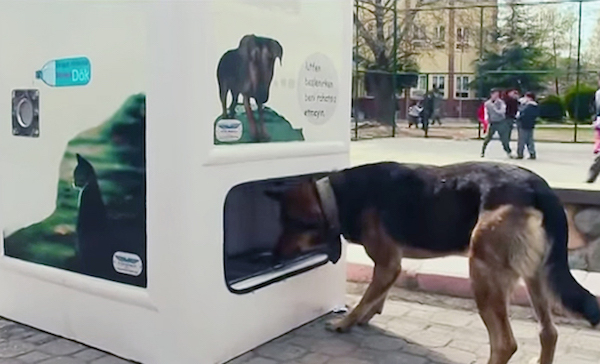 In Istanbul, a city with a quite a stray dog problem it seems, (over 150,000 strays are said to roam the streets) a company called Pugedon has come up with a viable solution to feeding these poor dogs. In various neighborhoods throughout Istanbul, Pugedon Smart Recycling Boxes have been installed. 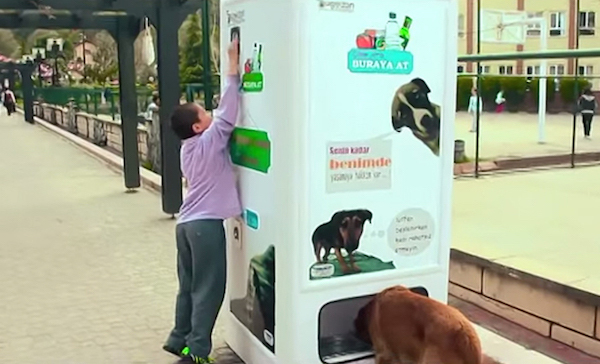 These machines literally dispense dog food every time someone deposits a plastic bottle for recycling. I would certainly head down to a recycling vending machine if they had one where I live. The small change I get for taking my bottles to the supermarket doesn’t even touch the sides of my shopping bill. I would much prefer to recycle bottles and know that food was immediately going to where it is needed. Thankfully however, I have never seen a stray dog in my neighborhood. Still, it does open your mind to ideas of how recycling can benefit causes outside of the main environmental one. It is also good to know that some help is going towards that staggering amount of stray dogs in Istanbul. Although, the powers that be clearly have to look further into the issue beyond dog food dispensing vending machines.